The Columbia River, which widens before emptying into the Pacific Ocean, is the border between Oregon and Washington at the coast. The Lewis and Clark Expedition established Fort Clatsop, their winter quarters, near present-day Astoria, Oregon. During that winter, Corps members explored places on both sides of the river, going as far south as Seaside and as far north as Long Beach. The Lewis and Clark Expedition reached Grays Bay on November 7, 1805, overjoyed to view what they believed to be the Pacific Ocean. A miserable, three-week rain storm halted further travel. They were stuck at "Dismal Nitch" for six days before the Corps established what they called "Station Camp" on Nov 15, remaining there for 10 days. Their first glimpse of the actual Pacific came on November 18, when they hiked over the hill at Cape Disappointment to view a wild and inhospitable coast. On November 24, by a vote of the entire Corps including Sacagawea and York, they decided to make their winter camp on the Oregon side of the river. Choosing a site based on the availability of elk and river access to the ocean, the Corps built their winter quarters. They called their settlement "Fort Clatsop," in honor of the friendly local people. Fort building commenced on December 9, 1805. The entire winter was wet and miserable for the Corps. In addition to resting and restocking their supplies, Expedition members spent their time exploring the surrounding region. Their hope of encountering a European trading ship remained unfulfilled. 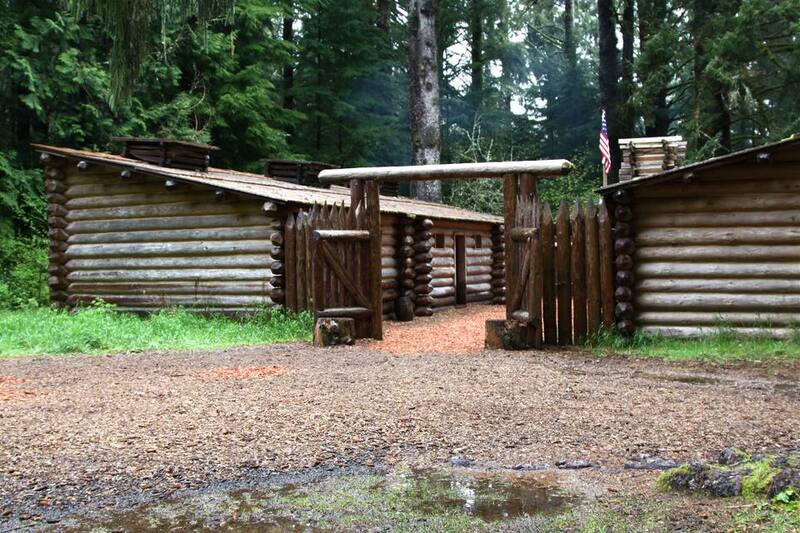 Lewis and Clark and the Corps of Discovery remained at Fort Clatsop until March 23, 1806. Astoria, Oregon, founded just a few years after the Corps' 1805/1806 winter at Fort Clatsop, was the first permanent US settlement on the Pacific Coast. Over the years, people have been attracted to the lands at and around the mouth of the Columbia River for a number of reasons, starting with the fur trade. Later, fishing, transportation, tourism, and military installations have been the region's major draws. Lewis and Clark National Historical Park includes 12 different sites that are in the states of Oregon and Washington. The major sites to visit in the park include the Lewis and Clark National Historical Park Interpretive Center in Cape Disappointment State Park near Ilwaco, Washington, and the Fort Clatsop Visitor Center near Astoria, Oregon. Both are among the highlight attractions along the entire Lewis and Clark Trail and are highly recommended. Dismal Nitch (Washington) - Today this land has been conserved, with a nearby portion serving as a roadside rest area. The Dismal Nitch site provides wonderful views of the Columbia River, local wildlife, and the Astoria-Megler Bridge. Station Camp (Washington) - Once freed from the "dismal nitch," the Lewis and Clark Expedition settled at a better campsite, staying there from November 15 to 25, 1805. They called this site "Station Camp" and used it as a base to explore the area while deciding their next steps. The Station Campsite, which is also a significant archaeological site, is still under development as a park and interpretive attraction. Cape Disappointment State Park (Washington) - Ilwaco, Washington, and Cape Disappointment State Park are situated at the mouth of the Columbia River. It was here that Lewis and Clark and The Corps of Discovery finally reached their goal - the Pacific Ocean. The Lewis and Clark National Historical Park Interpretive Center presents their story, offering exhibits, and artifacts, as well as murals and photographs that correspond to expedition journal entries. Other attractions at Cape Disappointment State Park and the surrounding area include Fort Canby, the North Head Lighthouse, the Colbert House Museum, Fort Columbia Interpretive Center, and Fort Columbia Commanding Officer's House Museum. Camping, boating, and beachcombing are a few of the recreational opportunities available to Cape Disappointment State Park visitors. Fort Clatsop Replica & Visitor Center (Oregon) - The Corps of Discovery built their winter quarters, called Fort Clatsop, near modern-day Astoria, Oregon. Although the original structure no longer survives, a replica was built using the dimensions found in Clark's journal. Visitors can tour the fort, see living reenactments of the Corps' daily life, hike or paddle to Netul Landing, and view replica dugouts at Canoe Landing. Inside the Fort Clatsop Visitor Center, you can explore fascinating exhibits and artifacts, see two interesting films, and check out their gift and bookstore. Fort to Sea Trail (Oregon) - The Fort to Sea Trail, a 6.5-mile hiking trail, goes from Fort Clatsop to Oregon's Sunset Beach State Recreation Area. The trail passes through dense rainforest and wetlands to the Pacific Ocean, passing through the same terrain that the Corps of Discovery traveled during their winter exploration and activities. Ecola State Park (Oregon) - After trading with a local tribe for blubber from a recently beached whale, several Corps members decided both to see the whale remains themselves and to obtain more blubber. The beached-whale site lies within Ecola State Park. This popular park takes its name from Ecola Creek, which received its name from Clark. Within the park, you'll find the 2.5-mile Clatsop Loop interpretive trail, where you can experience the same challenging route used by Clark, Sacagawea, and other Expedition members. Other Ecola State Park activities include surfing, picnicking, lighthouse viewing, walk-in camping, and beach exploring. This extremely scenic section of Oregon Coast is located just north of Cannon Beach. The Salt Works (Oregon) - Located in Seaside, Oregon, The Salt Works is part of the Lewis and Clark National Historical Park. Several Corps members established camp at the site for most of January and February 1806. They built a furnace to produce salt, which was required for food preservation and seasoning. The site is well-preserved with excellent interpretive signage and can be visited year-round.